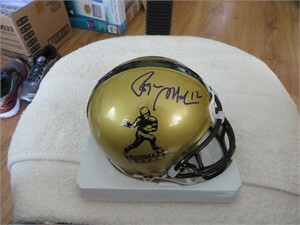 Gold Heisman Trophy logo Riddell mini helmet autographed in blue marker by legendary Navy and Dallas Cowboys quarterback Roger Staubach, who won the Heisman in 1963 and is a College and Pro Football Hall of Famer. Obtained in person, with certificate of authenticity from AutographsForSale.com. ONLY ONE AVAILABLE FOR SALE.